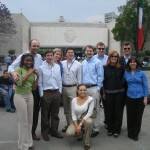 Class schedule – the general belief is that Darden students prepare 3 cases per day, 5 days per week. This perception falls somewhere between the actual workload and the workload from when Darden was founded. In 1954, classes were taught 6 days per week and there were 3 cases every day. I’ve even heard rumors that exams were administered on Sundays so they wouldn’t interfere with the class schedule. 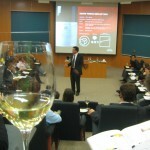 The first year program for the class of 2009 averaged about 12 cases per week. Our schedule alternated between 4 and 5 teaching days per week and 2 and 3 cases per day. I’ve provided a snapshot of a typical Darden week in my weekly schedule post. Case method – most classes begin with the professor selecting a student at random to present and defend their analysis of a business case. With participation accounting for about 50% of final course grades, Darden students prepare for every class session. In comparison, lecture format classes found at other schools may not require any preparation. One advantage of working through cases during the quarter is the limited amount of studying needed for exams. In fact, many Darden students only spend a couple hours studying for each exam. I’ve written more on Darden’s teaching style in my case method post. Attendance policy – students are allowed to miss two classes per quarter without a valid reason. This policy helps ensure high attendance, which is necessary at a school where classroom discussion is an integral part of the learning process. I remember the class of 2009 being generally supportive of this policy when it was introduced during first year orientation – apparently there was no expectation of skipping class. 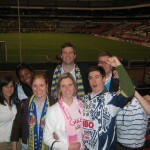 Learning teams – part of the case method, these teams generally meet the evenings before class is taught. Although these meetings take time, they ultimately reduce the total time most students spend preparing for class. In my team we assigned each individual one case to analyze for the next day. Each team member would then share the results of their analysis in the evening learning team meeting. Therefore, on any given night I only analyzed one case in depth and then reviewed my team members’ work on the remaining cases for the next day. In addition to their efficiency benefits, these meetings provided a great environment for learning how to effectively review other people’s work – an important skill for MBA graduates. Image promotion – Darden’s students, alumni, and faculty often promote the ‘Darden students work harder’ perception through their own personal dialogues. It’s often with a sense of pride that someone from the Darden community discusses the rigors of the program. All these factors contribute to a culture in which working hard is valued. The communication of this culture has a reinforcing effect as prospective students looking for an easy or ‘social’ MBA generally choose to attend other schools. The result is a student body that expects to work hard for a well respected education. This culture applies to our community as a whole and does not necessarily mean that Darden’s academic program is more time intensive than programs at other schools. From my own observations, the hardest working students at Darden spend less than half their time on the academic program and devote huge amounts of energy towards club leadership positions or multi-industry career searches.